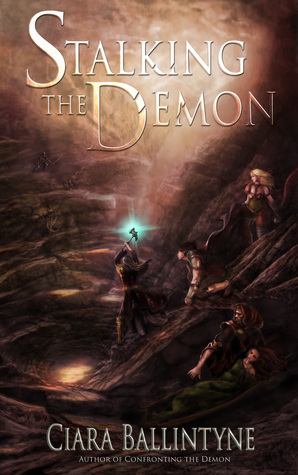 Stalking the Demon was a well written, detailed fantasy about wizards and the seven circles of hell. I will admit that I found myself often confused with the waterfall of information I had to consume. It was because this was book two and I hadn't read book one first. I definitely could have benefitted from reading book one first, but I made it through and that's all that matters. The writing was SUPERB in this book, let me just say that up front. It was a short book so the author didn't waste a word on things that didn't pertain to the plot of this particular book. That's always appreciated. And I really enjoyed the plot of this book. As a Supernatural fan girl, anything with demons in it is sure to interest me and this book was no exception. Though the wizards and not the demons were the focal point of this book, just the idea of them intrigued me and I liked the idea of the seven circles of hell. The author really worked out what kinds of demons were from which circle of hell and that was important. Though I felt overwhelmed at times it was nice to know that the author had it all worked out so well that there was really no need for me to. There is a romance that drives this story between Alloran and Gisayne, but it does not take over the story and that was nice. I think reading the first book would give me more insight into their relationship because I don't completely understand it as of now. That didn't take away from my reading experience too much but I'd still like to know more of their history before continuing on in the series. One thing I don't think I got to see enough of was the magic. Since pretty much all of the characters in this book/series are wizards I would think there would have been magic flowing on every page. Magic was talked about more than it was practiced and when it was used it was for the purposes of trying to solve the problem that was started in book one. That's okay, I guess. I just expected more that's all. I still appreciated the magic that was used because when it was it was pretty cool. Overall, I think this is a book worth recommending. Like I said, I still need to book one but I have no doubt it's just as well written and thought out as this one. So if you're looking for a fantasy book with wizards and magic that's more for adults than young people, then I can definitely recommend this book. I'm looking forward to book three which looks like it will be a very exciting addition to the series!